It's no secret that I'm a little obsessed with blush-like colors lately. I went from literally no pink in my closet to.... Let me wear pink everyday please! 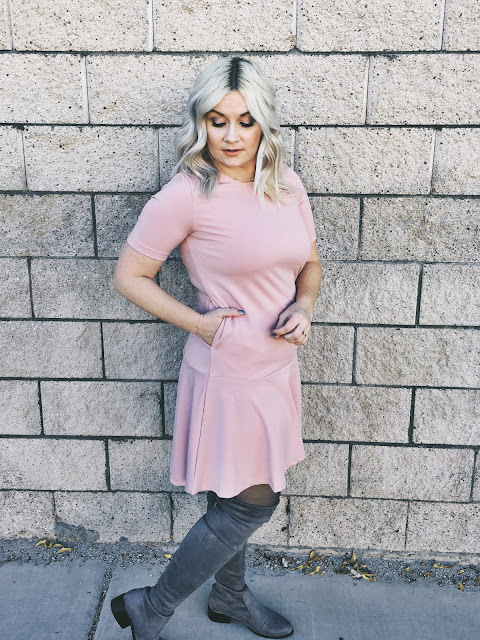 This blush drop waist ruffle hem dress is the latest STEAL I've found. It's $15 and really good quality. Besides the blush color being spot on for Fall, the material is very soft and stretchy. It's also thick material which helps make it flattering but not super heavy and hot. I personally like my dresses a touch longer and not super tight, so went with a medium on this dress and I'm 5'4. To shop this dress and others similar, visit Zaful. Thanks for stopping by. Happy Monday and have a great week! I totally did not know that blush is a staple Fall color. I love that you found a dress that was so inexpensive and comfy too. That dress is absolutely gorgeous - such a pretty color. I love that it's a touch longer, too! I love that color to and I would definitely wear that dress! It is very cute! Perfect to any occasion! Great price too! Thank you. This is one of my favourite colors. Looks great, especially with those grey boots. What a pretty dress on you! The color is so pretty! This dress looks amazing on you! I love the color choice. I have to check to see if they have the dress in my size. what a pretty dress, love the color! My favourite colour and you look fab! You go, girl! You look absolutely fabulous because blush pink is YOUR COLOR! So pretty! Omg what a chic look!!! Love the color of the dress. So cute. Nothing better than pink! Thank you. Slowly adding more and more pink and am loving it! pockets are the best! I had pockets in my wedding dress and was the best decision haha. also a pretty colour!